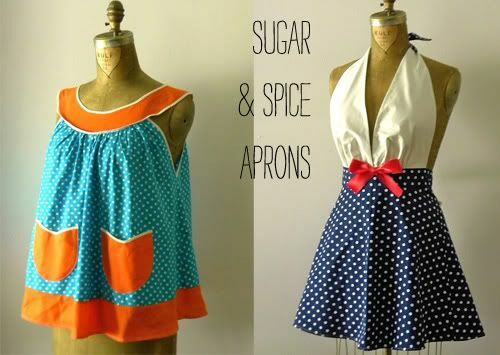 Sponsor Crush:: Sugar & Spice Aprons. People, I have a confession to make: I’m a little bit of an apron whore. I inherited a big box of vintage aprons from my grandmothers and have quite a lovely collection of fancy pretty pretty aprons, but I like aprons that can actually stand up to full beatdown of cooking–from the spaghetti sauce to making the pie crust. But at the same time, I want to look pretty. That is why I’m so happy that Danielle’s darling little apron company, Sugar and Spice exists! Because they are perfect. They look great over that simple black dress you decide to wear for your dinner party and add a wonderful pop of sass to boot! And I think a whole slew of you folks are equally charmed by her handmade aprons–since you said so in our giveaway! I’m totally crushing on the charming Ms. Danielle, who I had the wonderful pleasure of sitting down with over a nice e-glass of homemade lemonade with mint because that’s how we roll. So let’s find out what makes Danielle click, shall we? MK: Hello there! How did you get your start making aprons? Danielle: It all started when I was 16 years old, and desperately wanted to learn how to sew so that I could make my own fabulous clothing! However, I could not for the life of me, find a good sewing teacher! So, using my notorious initiative, I decided to teach myself. When I went pattern shopping, I knew I wanted something that would require a little more skill than a tote bag ( after all, I already knew how to sew straight lines!). That’s when I stumbled upon these GORGEOUS 50’s style apron patterns. I figured aprons would be perfect practice pieces, and I knew my loving, supportive mother would wear all the “practice ones” I made. But, after a while my practice aprons started looking better and better. One day my mom posted photos of all the aprons I made her online to share with her friends; pretty soon I was getting orders left and right! Thus, a business was born. MK: Right on, lady! You started your business at 16….this makes me wonder, what were you like as a child?? What were your favorite toys/things to do? Danielle: As a child, I was always very precocious. I guess I’ve been business minded from the start. First I sold items out of catalog around my neighbor, and got paid a whole $2 commission from the catalog company per item I sold! Then I started raking lawns every fall when I was about 9 years old. And at 10, I started a neighborhood newsletter! I interviewed the neighborhood families; I had a Feature Pet column, a crossword puzzle, and I even gave out an award for Best Lawn. It was so much fun creating my newsletter every month; I eventually got up to about 50 subscribers! When I was little my favorite toys were my Barbie dolls and my Littlest Pet Shop sets. I liked doing all the different voices for the different animals/Barbies as I played with them. Lol. MK: How very entrepreneurial! I remember selling puffy stickers in the back of my second grade class, but that was it. Note to self: write post on PUFFY STICKERS! MK: Have you ever had a sewing-related injury or any big calamity? I sure hope not, but if so, give us the gory details! Danielle: Luckily, I have never had a sewing related injury. But I’ve definitely had my fair shares of calamities! On my first wholesale order, RIGHT in the middle of producing 150 aprons ALL by myself, Wright’s ( the big sewing products company) decided to move their corporate location, and SUSPENDED all shipments of bias tape! Not just to little businesses like me, but to all the retail and online stores as well. Wrights is pretty much the only bias tape you can buy, and I couldn’t order more bias tape, because no one else had any to send either! I had to drive to every fabric store within a 100 mile radius to buy whatever they had left in stock. It was a nightmare! But, I did pull through. MK: Gah! That doesn’t sound awful! But very resourceful of you! Say, Is there a story behind the name Sugar and Spice? MK: And it does–I love the name–so perfect for the kitchen too! OK, random question: What is one place you really want to visit that you haven’t been to before? Me too! Oh Danielle, you are as lovely as your aprons and thanks so much for being a sponsor. We are very lucky to have you and I hope you stay around awhile. And friends, do check out Danielle’s wonderful Etsy shop of aprons, Sugar and Spice. 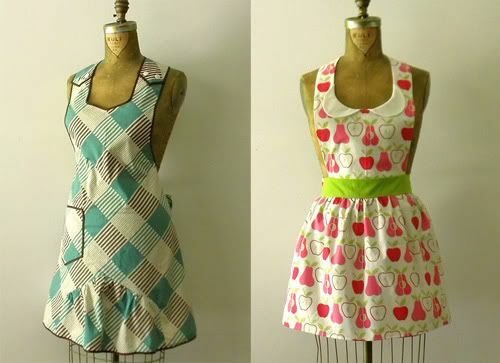 Tagged with sponsor profile, Sugar & Spice Etsy shop, vintage style aprons. I always want to buy these gorgeous aprons, and then think about how messy I am, and how I use them as napkins! But that smock is just too adorable–like the housecoats my grandmother used to wear, only way cuter! Oh, so pretty!! My favorite is the one with the oversize aqua gingham print. And wow, Danielle was a busy kid! I loved hearing about how she got her start sewing. Those 50s apron patterns really paid off.